A couple of weeks ago when I showed up to work this guy was in our parking lot. I had to ‘honk’ to get him to move. The incentive to showing up to work early is being able to grab a parking space. It’s one thing when you’re competing with your co-workers, but this? Well, it just makes me smile…especially when they’re in the boss's spot. I love this time of year. 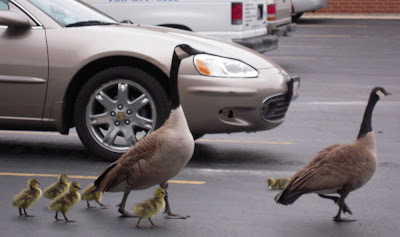 The babies are just darling, and it's funny as hell to see geese in parking lots, sitting next to a 5 inch puddle. They are adorable! I'm sure the duck poop they leave all over the parking lot is adorable too!!! I would totally feed them every morning. 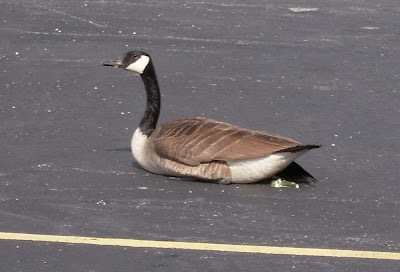 I'm a sucker for ducks/geese wandering around on concrete! Very cute and fuzzy ones. But yea, I hope they don't get poop in your tires! Sort of gives new meaning to that whole "take your kids to work" thing, doesn't it? And just think. All those babies will come back to that parking lot to have their babies and those babies will come back to have their babies and then... well, you get the idea. Basically, your company is going to have to close down because in a few years that place is going to be a goose nursery. How cute are they? Very discerning geese too taking over the boss's spot. Love it! Puts a smile on your face to see something so cute and fun in the morning. I love it!! !